record Roosterfish released unharmed at 157lbs. Jason also specializes in Marlin: Blues, Blacks, Stripes, Sailfish, Yellow fin tuna, Wahoo, and Mahi Mahi. Neptune’s Defenders: Jason when did you first start fishing; was it saltwater, freshwater, or both? Jason Coffrin: I have been fishing for 28 years since I was 2 years old. 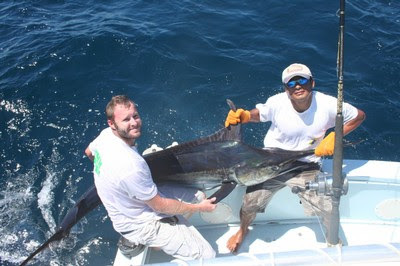 My first fish was a catfish in a cow pond and now I’m chasing the dream of a 2000lb Marlin in Costa Rica. what made you choose Costa Rica? have done it with out them! ND: Do you practice sustainable fishing with catch and release of Billfish? and swimming with these giants until they are ready to go. Check flamingo-fishing.com for photos of that! ND: What fish would you say is the most over-fished in Costa Rica? JC: My opinion, Marlin and Tuna. ND: What good eating fish is in the most abundance in CR? JC: Mahi Mahi and Grouper are all over, you just have to go with the right Captain…Mr. Trigger (smiles). willing to help all the time! I’ve only experienced the jealousy in CR...everywhere else has been straight up help! It’s an awesome ride! are the boat for you. Supplying fun and memories for everyone on the planet! out of a 3-5 day trip to CR? JC: Contact me on jctriggerman@yahoo.com; I will put together a trip of a lifetime! you are going to get that memorable catch! most out of a 3-5 day trip to CR? to put on their wall or eat? that…tourists…most boats have the same beliefs as I do on the matter. Billfish keep our sport alive. ND: What is your best fishing story? and it spooled a 30lb. class reel in 10 seconds flat, 2 times. I fought it for 4 hours in a storm with 5-foot waves. We got it up and chased it at 25 mph until it spooled us again, jumped 13 times then dove again to chase bait…that is a BAD fish! Those are truly monsters of the sea. I get tips and techniques from the great Bart Miller, CEO and founder of Black Bart lures. Everyone that has caught a Billfish on plastic has heard of him. Now he is teaching me. The man is a marvel! ND: Any close calls or hairy situations while living outside the US? ND: Outside of fishing, what is your favorite outdoor activity to do in CR? JC: Working on my boat! That’s all I do, I’m eaten up with it!